Posted on July 13, 2018 - By Fucosoft | Follow YouTube, Twitter to Get More Information. MP3 and WAV are two major file standards for digital audio and used in all areas, from portable players, and handheld recorders, to audio interfaces and more. However, WAV files are usually large in size so it takes up much space to save or share them. Besides, a majority of the latest music players do not play WAV files. So if you have your favorite audio files saved in WAV format, you’ll need to convert WAV music to the universal MP3 format then you can freely play on any gadget. There are many MP3 converters available to get the job done. Here this guide will cover 5 easy solutions for you to convert WAV to MP3. Read on and pick the one that suits your needs best. Fucosoft Video Converter is the best solution to convert WAV audio files to MP3 format. With this smart tool, you can convert all commonly used audio formats like MP3, WAV, M4R, M4A, MKA, FLAC, ACE, OGG, and more. Moreover, it guarantees 30X faster conversion speed, high-quality output and many more excellent features. Download and install Fucosoft WAV to MP3 Converter on your computer, then run it. Click “+ Add Files” to import the WAV files that you wish to convert. Also, you can direct drag and drop them into the program. Click the drop-down icon next to “Convert all files to” and then tap “Audio” to choose MP3 as the output format. 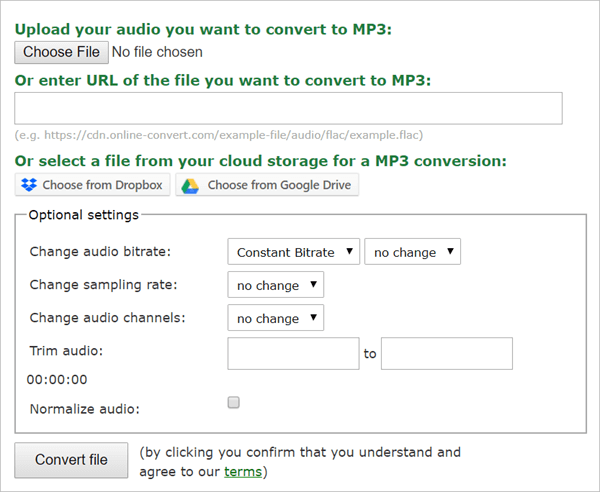 Click either the “Convert” button or the “Convert All” button to begin converting WAV file to MP3 audio file. Windows Media Player is the default media player for Windows and supports a selection of audio formats. Amazingly, it is not just a media player. If you want to convert WAV files to MP3 format, Windows Media Player is also a good option. Additionally, you can rip music from CD or burn your own CD with this music player. 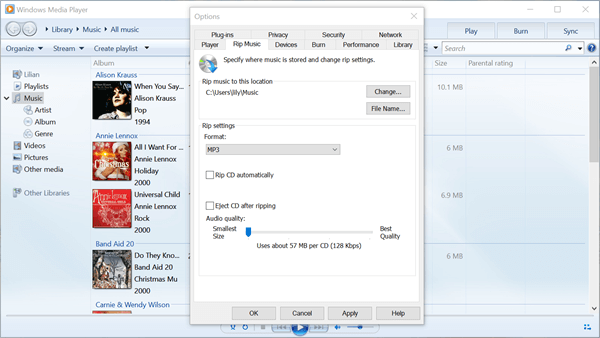 Launch the Windows Media Player on your PC and drag the WAV file to the program’s interface. Also, you can insert the CD that has the WAV audio. Locate your library files or click on CD that you uploaded to display the WAV files. Go to the left panel of the screen, click on “Organize” and then “Options”. Now click on “Rip Music” and then select the “RIP Settings” option. After that, click on “Format” and select “MP3” format. Finally click on “Apply” and then “OK” to rip MP3 from WAV files to your computer or portable disc. 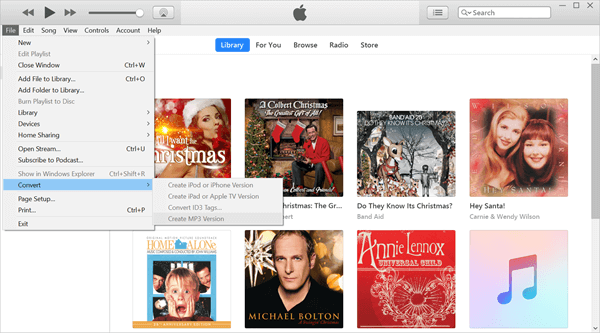 Apple’s iTunes is mainly designed to help iPhone/iPad users to manage their media library. Also it allows you do some basic audio conversions. With iTunes, you can easily get your music files converted to your desired audio formats, including WAV to MP3. You do not have to be an expert to do this. Just follow the simple steps below. Run iTunes and then drag the target WAV file into the program’s interface. Tap on “Edit” and click on the “Preferences” button in the Edit drop-list. You will be redirected to a new window. Now hit on “Import Settings” under the “General” tab, and choose “MP3 Encoder” from the “Import Using” drop-down menu. Go to “Advanced” menu to specify the output folder and hit “OK”. Then select “File” and go to “Convert” > “Create MP3 Version”. 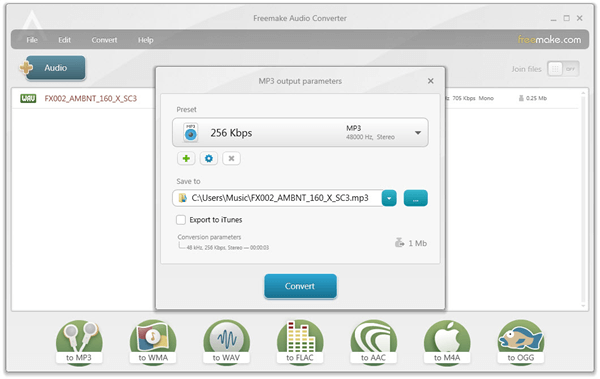 Freemake Video Converter is another good choice if you need to convert WAV to MP3 for free. This freeware an help you convert any type of WAV music file to a universal MP3 format that you can freely played on any portable gadget like Apple and Android smartphones, tablets, and more. Install and launch this WAV to MP3 converter freeware on your computer. Add the WAV files you wish to convert by clicking on the “+ Audio” icon or simply drag and drop the files to be converted. Select “To MP3” in the freeware’s formats panel, then choose a preset for your desired final settings as well as the folder where you want to save the converted MP3 files. After that, click on the “Convert” button to start the WAV to MP3 conversion process. This might take a few seconds or minutes depending on your computer capacity. If you don’t want to install any software or media player on your computer, there are many online services that enables you to easily convert WAV to MP3. Among then, Online-Convert is a good option. This WAV to MP3 converter online tool is easy to use and has a relatively good performance. Just upload your WAV files and then download MP3 within seconds. Open your browser and go to official Online-Convert website: https://audio.online-convert.com/convert-to-mp3. Upload the WAV file you wish to convert by clicking on the “Choose File” box on the program’s interface. In “Optional settings”, you can adjust the audio bitrate, sample rate, channels, and even trim audio. Now hit the “Convert File” button to start the process. Once the conversion is complete, click “Download” and save the converted MP3 file. Now you’ve learned 5 easy ways to convert WAV to MP3 file. Therefore, there is absolutely no reason why you should continue using the large WAV files that take up a lot of space when you can simply convert them to MP3 music that are portable and easy to use on any music player gadget.